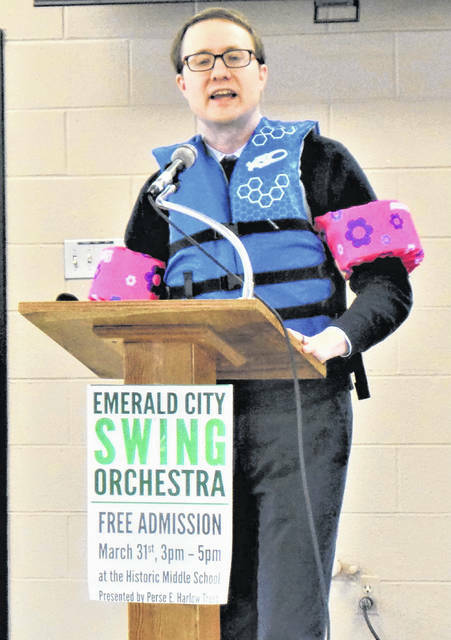 The March 28 Lenten Luncheon speaker, First Presbyterian’s Pastor Gray Marshall, stands behind a lectern holding a sign publicizing a free orchestra concert on March 31 for the community. Funds for the concert came from a trust established in the will of a longtime First Presbyterian leader, Perse Harlow. The Lenten Luncheons of Grace United Methodist Church began 50 years ago, in 1969, when Methodist women introduced the idea as a church service project for the entire Christian community in Fayette County. Today, the third generation still carries on the tradition, an effort that easily can involve meals for more than 130 guests. They determine menus, up-size the selected recipes (some recipes are third-generation as well) to the desired proportions, and shop for groceries; then three alternating teams of cooks prepare the food. Church members of both sexes help with the serving and thus act as a “face” of Grace United Methodist Church to locals from many different church congregations. Two remaining Lenten Luncheons are scheduled this year, on the Thursday noons of April 4 and April 11. Anyone wishing a reservation may telephone the church by the previous Friday.